We are likely just 24 hours away from a Grand Jury decision in the officer involved shooting of Michael Brown in Ferguson, MO. Scores of Department of Homeland Security vehicles have been spotted 25 minutes outside of town and the Governor of Missouri has already declared a state of emergency in anticipation of the fallout should officer Darren Wilson be exonerated. National Guard units have been called up and one law enforcement official has advised residents to be armed because the police department will not be able to protect the town’s citizens should violence erupt. And violence is exactly what we should expect – more specifically, violence against Caucasians and their children. Two recently recorded videos have surfaced from the Ferguson area showing activists and protesters who are developing a strategy for how they will engage in civil disobedience and who they will target. During the height of the protests following Michael Brown’s death President Obama sent Attorney General Eric Holder to investigate civil rights violations. 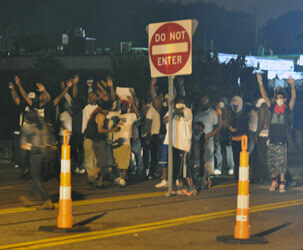 Now that the targets for the coming mass protests have become white people, will Obama act again to ensure the peace? Or does that only apply when racism affects African Americans? Whatever the case, should the decision be in favor of Darren Wilson then we may well see riots across the country that surpass the violence and destruction we saw in Detroit in 1967 or Los Angeles following the Rodney King verdict in 1992. For those resident in the immediate St. Louis area, you should already be prepared for civil unrest. But, this may not be limited to just Missouri. There are “direct action trainings” taking place across the country and reports indicate that as many as 83 cities are being targeted by protesters. Given the direct action training being provided by the likes of Lisa Fithian, it is not unreasonable to suggest that the targets of these protests, riots and possibly violence will be white people, including children. Officials have warned resident to be prepared for a period of disruption. It turns out that when violent looters come face to face with people prepared to kill to defend their property, the looters tend to choose a ‘safer’ target. Here is a general list of supplies to have on hand. Remember that sometimes power supplies are lost during situations like this. Occasionally officials do this to gain more control over the populace and sometimes it happens as a side-effect of the wholesale destruction by the rioters. Keep the potential for a down-grid situation in mind when preparing. We urge our readers, regardless of your skin color or location, to be vigilant. When the violence breaks out no one will be immune. Stay off the streets if riots or protests erupt in your city if at all possible. Otherwise, move quickly, don’t attract attention and be prepared to defend yourself with deadly force. This article originally appeared at SHTFplan.com and we thank Mac Slavo for allowing us to share his work!